Richard Dawkins says we do not come from Chimpanzees, but rather we come from a common ancestor. It astounds me that they think believers are so stupid but this is their own doing because this is what we were shown from an early age. Have you ever seen this picture? The little black number on the left sure seems like a chimp. 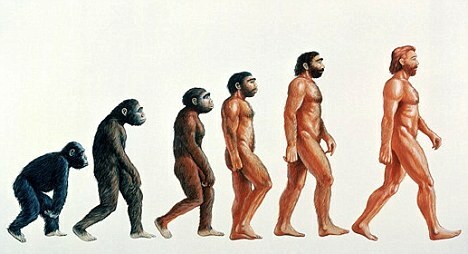 All that said, do you know that none of these figures from ape on the left to man on the right actually exist. We only have ape fossils and man fossils. If you look at the image from the artists rendering, it does seem quite possible that this is a fact. However, there is no evidence to back up this picture. Please look at this ancestry tree. Notice just like the tree shown by Richard Dawkins the branch species which are supposed to be our common ancestor in the whole tree is Gone. You can google this tree and you will not find any real fossils that were dug up to fill in those branches - for instance at 400,000 years ago, 4.5 - 6 million years ago and so on. Furthermore, If I gave you a range of pictures of fruit and then placed a piece of meat in that row and asked you to pick the one that does not fit, which one would you pick. Now out of this row, which one does not seem to fit. There seems to be a commonality between all the great apes which would show common ancestry, but what does the human do in here. Clearly, common sense tells you that it does not fit. Because this does not make sense, it is claimed that this tree is of genetic ancestry. Again, the great apes all have 48 Chromosomes and Humans only have 46. 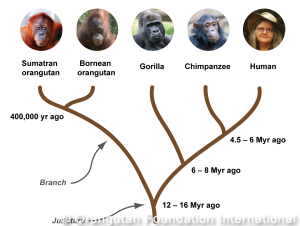 It clearly shows that the great apes share the same traits as can be seen in the pictures. The human is on a unique line that does not fit in with the great apes. The recent discovery of the merged chromosome on two and that it is the merger of two ape chromosomes into one is the reason why we are also from the apes. It seems something happened to make humans completely different from the great apes a very long time ago. Now, what about those hominid fossils. Don't they show a common ancestor? Quite impressive right. But look at this. See someone found the hands, the hair, the eyes and the feet, because here it is, Lucy in all her glory. I have to give the scientists on this project real salutes. How they knew what Lucy looked like from the scraps of bones found in the cast above, is anyone's guess. But hold on, if it is anyone's guess, then how do we know this is really what Lucy looked like? What if Lucy had no hair? What if Lucy had ape-like hands and feet and not human feet? What if Lucy did not have human-like eyes with the big whites? 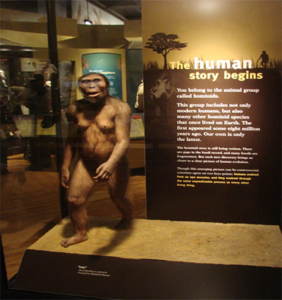 Needless to say the scientific community of late discarded the Lucy find as an early human ancestor. Still, it astounds me how much detail scientists can draw from scraps of bone. Did you know they have a whole history of Lucy? Where did that come from except the healthy imagination of educated guesses? Have you ever wondered how they knew what the dinosaur skin looked like? What their habits were? how they hunted and lived? All this from bones they found buried. Incredible. Posted in Origens - Worldview.